Sign outside: "You may not be interested in the war, but the war is interested in you." 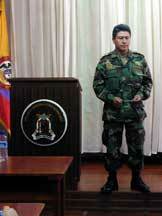 Coronel Gilberto Ibarra Mendoza, new commandant at "JHL" Infantry Battalion, was with troops in the southwest of Cauca. In his stead, Sgt. Silva presented. Silva was assisted by Sgt. Betancur. Their themes: "the human rights situation, international law, and the situation for individuals." Silva: My area is S-5, the Public Relations Branch. I manage a radio station which covers Cauca, Tolima, Narino, and Valle Cauca. Cauca is extensive, with difficult terrain. For this reason, groups like the ELN and FARC use this terrain. Also, after the closing of the DMZ, many armed actors came to "the boot" of Cauca. Our Commandante Ibarra is heading an operation in La Vega, _______, and _______, because he said that we need to establish a puiblic presence there. There are many ELN, FARC, and AUC columns operating, all of them acting in violation of international law. Carol had a question about defining their military mission. Silva: The principle objective is to defend the honor and the goods of the Colombian people, and to protect democracy. Margaret asked about their relationship to the paras. Silva: We have a law that says that anyone in the army who has connections with any of the marginal armed groups will be condemned and sentenced for 40 years. There are no connections with the army or with the Third Brigade in Cali. To us the paramilitaries are like the other illegal armed actors, the guerrillas. Silva: Fumigation planes are based in Santa Fe de Bogota. The national government has been asking permission to use US resources against the narco-terrorists. We want to stop these groups at the margins of the law. Over the course of a year, we go to each municipality with civic programs. We take doctors, recreation, orthodontists, etc. The more remote communities get an airdrop. Kept reiterating, "We defend the goods and honor." Ed -- Have US trainers helped to shape the public relations ? What of your personal training? Silva: We get directions from Document 00026 which identifies all the programs we are to carry out for the civilian population, as well as how to relate to the church and the government. Silva has been in army 22 years; all of his training has been in Colombia, including public relations training and psychological training in Popayan. 4. together these will build the economy. The entire population must support Uribe's plan to destroy the illicit production of crops. Three members of the 48th Battalion recently killed, along with a narco-terrorist. Carol: Do you include the paras in that term "narco-terrorist"? Silva: Yes. National government has requested use of the term "narco-terrorist" as a consequence of its use in Europe and the US. The term has international and national usage and includes the AUC as well as guerrillas. 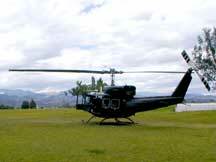 Huey gunship at the base. Our mission is to cover the department of Cauca, which is the largest of the departments. And we cover it alone. He enumerated that there are seven groups of FARC and four groups of ELN: "That makes eleven groups for us to be fighting, and we are only three rapid attack companies." Many guerrillas have come from the former DMZ. We also coordinate with police to try to provide services to the people of Cauca. Our jurisdiction has 42 municipalities and we cover 20 of them. The Cali Battalion covers those above Santander. We also cover the Pan-Am Hwy. The Pacific Coast is covered by the Colombian Navy. We never get into coastal, jungle area. The impenetrable jungle of the west has rivers used by the guerrillas to transit out drugs from the eastern part of the country. There is an operational situation in Cauca. We have been trying to take back Almaguer from the FARC and ELN the last couple of days. 13 ELN and FARC have been captured, 49 bandits, and 3 defectors from the guerrilla. Margaret: Earlier you identified that your three companies are up against eleven armed groups, but you only named guerrilla groups. Is it your mission to engage the paras as well? Zapata: Our focus has been on protecting the Pan-Am Hwy -- and there is a lot of activity by guerrillas and bandits there. Re: the AUC -- they are still new in Cauca, but we have engaged them in combat and captured some. They usually run from us! We work with International Humanitarian Law. Three mountain ranges allow a strategic advantage to the narco-traffickers. We are recuperating lands in the south because of attacks against civilians and the forced recruiting of young boys. I...Images © MMII CircleVision.org. All rights reserved.